Recently The Geek In Question posted an awesome graph to help visualize the stages of euphoria and despair she experiences while going through the manuscript process. Fellow grad students David Winter (The Atavism) and Morgan Jackson (Biodiversity in Focus) each took the bait and ran with their own version of the process. It has been far too many years since I was a grad student (moment of whimsy overtakes me), and I’ve gone through the manuscript process so many times now that I actually find the whole thing rather enjoyable. Presumably this results from my love of writing, combined with the sageness of having experienced most of the potential pitfalls and feeling confident in how to prevent or deal with them. I’ve been at this long enough to know what I like and what I don’t like, and it strikes me that I love the up front and the final product, but there are elements in between that I simply detest. I love time in the field—a bad day in the field is better than a good day of just about anything else. Some of my best field memories involved getting skunked on the collecting, just because the field experience itself was so weird, new, eventful, etc. I’ve spent days in the desert, it’s dry environs parched by drought, with nary a beetle to be had despite beating hundreds of tree branches. I hated it at the time, but I get euphoric recall of those days when I see something that reminds me of those trips. Even driving between localities, while not time “in the field,” is enjoyable for me as it’s a chance to see the landscapes. It’s only when I have to take time out to buy supplies mid-trip and, especially, hunt for hotels late in the day, that I stop enjoying my time completely. After I’ve collected the specimens is where I hit the snag—pinning and labeling, ugh!!! It wasn’t always that way; in my younger days I rather enjoyed it. But in those days I was practicing my art and gaining skills. Now I’m as good at pinning/labeling as it gets, and my perfectionist tendencies don’t allow me to do anything less than perfect when I do do it. But it takes time—lots of time to do it perfectly, and especially when you collect the large numbers of specimens that I do. This is the point where I consistently question my decision not to pursue taxonomy as a career. I could have been enjoying the assistance of professional specimen preparators to take care of this for me, but nooo… I had to do it avocationally so I could “do my own thing”! Okay, a quick slap to the face and I’m back. Once those specimens are pinned and labeled, it’s all fun from here on out.¹ Identifying specimens and adding my “Det. label” is enormously satisfying, even for routine, common species. Excitement mounts if the specimen turns out to be something rare, more so if it represents something I’ve not collected before. This is normal for all collectors, but for me there are additional chances for excitement if the specimens represent new information—e.g., a new state or host plant record, or (gulp!) a new species! Identified specimens also form the basis for manuscripts, and once I’m at that stage it’s pure happiness. I love writing the manuscripts. I even love revising them based on reviewers feedback (even when not very positive—hey, it makes for an improved paper). About the only negative is a little bit of post-publication depression when you realize that your paper is actually read by only a small number of specialists, and you haven’t really offered anything ground-breaking, but rather just an incremental increase in the vast, collective knowledge. But I usually don’t have time to let that get me down—by then I’m already out in the field collecting more bugs! ¹ I probably should make a confession here—sometimes I go ahead and include data in manuscripts from specimens that I haven’t even pinned and labeled yet. The siren call of the unwritten manuscript is far more irresistible than the grating nagging of the unprepared specimen! This entry was posted in [No taxon] and tagged collecting trip, entomology, insect collection, insects, introspection, science, taxonomy. Bookmark the permalink. Your passion regarding arthropod-related endeavors is obvious to all of us, Ted. One of the reasons so many of us check out your blog on a regular basis is so that we too can experience the euphoria that accompanies one who is active all of the time in so many aspects of arthropod-related science and communications. It’s refreshing, and often cathartic. An awful lot of your Geek-Graph™ is in the 9-10 range. None of us can get too much of that! Happy Easter to you and your family, Ted! Hi Dave, thanks for reminding me how much time I spend in the 9-10 range. Life is good! Happy Easter to you and yours, as well! An interesting insight into the bug collecting life of Ted MacRae! As a photographer I have learned to avoid the pain of hotel/campground hunting by spending many nights sleeping in the car. It has the added benefit of being uncomfortable enough that I am guaranteed to wake up before dawn! At my age, sleeping in the car is uncomfortable enough to guarantee I never go to sleep! Honestly, bug collecting the way I do it is such a dirty, sweaty, exhausting exercise that I can’t imagine doing it without a shower and nice, hot meal to clean and fuel me up for the next day. Sleeping in the car works for a quick weekend shot somewhere and back, but on a longer collecting trip I’m more productive in the long run if I can rest in comfort each night. Heh. The bit I hate the most is the manuscript revision. I actually enjoy setting, pinning and labelling. Wow that post was very interesting to me as I do a lot of this in my collecting too (albeit on a much smaller scale) Great read. It’s not so much the specimens themselves that turn me on, but the information they represent. I’m actually suprised at the number of collectors who don’t enjoy publishing. 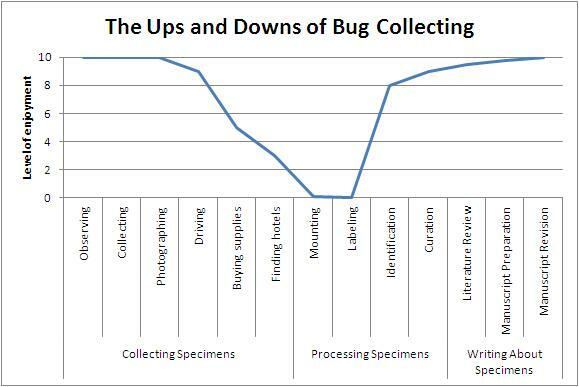 Collecting is really just data collection – it’s like spending all summer collecting data and then never writing up the results. In the throes of “finishing” (the longest stage!) a manuscript myself, I have to say my graph would definitely have a second large out dip near the end of your horizontal axis. Extended out to include acceptance and publication, it would (will) rise up to near 10 on the vertical scale. There has been the odd paper here and there that has given me fits during the revision phase or due to excessive time to publication, but they are isolated cases that melt into an overall high average. Even if I could hire a preparator, I don’t think it would save me much time – I’d constantly be watching with clenched teeth to make sure they did it right! There used to be a definite seasonality to my activities, but lately with all my travel north and south of the equator and a pretty consistent backlog in all other facets (not just specimen curation, but also material sent for IDs, manuscripts in various stages of preparation, etc.) it seems to be the middle of the season all year long. I just went out collecting today in northern Utah, I ended up rearing 4 Lucanus mazama larvae, which was nice, But beside that and a few ground beetles, I didn’t find much. It appears spring is just waking up 😛 at least where I live anyway. What part(s) of Argentina?? “Argentina” is now bigger in my tag cloud than “Oklahoma” and “Nebraska” which border my home state! The blog posts give a good idea where in Argentina – mostly Buenos Aires Province with occasional trips up north. Ted- what makes you think pro taxonomists don’t have to do their own pinning? All of them do their own pinning?